It is with great sadness that we inform you of the passing of Annette Rusler. 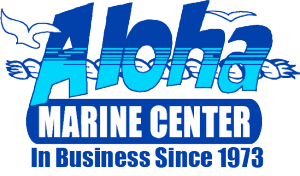 She was instrumental in operating the family owned Aloha Marine and worked here over forty years. Her smile and grace will be missed by all who knew her. Here she is with her son Dave Rusler. Annette Rusler, 88 of Ormond Beach, FL went to be with the Lord on February 3, 2019. Annette was born on June 4, 1930 in Hornell, N.Y. and grew up in Huntington, Indiana and resided in Ormond Beach, FL. She is now with her Husband James H. Rusler in heaven and is survived by her 3 children Dave Rusler, (Denise) Debra Vangen, (Philip) Mark Rusler, (Patty) four grandchildren, Christian Fornasier, Amy Rusler, Brandon Fornasier, and Benjamin Rusler, two great grandchildren and her sister, Shirley Crispen (Robert). She was predeceased by her parents, and her brother, Merrill Fetters. Annette graduated from Clear Creek High School in Huntington county and attended Huntington college with a minor in Child Psychology. She married James H. Rusler in January of 1951. She was active in politics in her early years, and became the president of the Young Republican Club of Huntington. She was a member of the Eastern Star and served as an officer in various positions. She was active in the PTA and various school organizations, and was also a substitute teacher in the Fort Wayne school system. They moved to Florida in 1973 and purchased Aloha Marine. She was an intricate part of the business as the Secretary and Treasurer for more than 40 years and was known as the Mom to all who worked there. Annette was an active member of First United Methodist Church of Ormond Beach. She successfully graduated from Disciple 1, 2, and 3 in the church, and enjoyed Bible study with all her friends. Most of all she loved being surrounded by her family and making memories. There will be a Visitation at Lohman’s funeral home at 733 W. Granada Blvd. in Ormond Beach on Thursday, February 7th from 4-7 p.m. There will be a Funeral service on Friday, February 8th at 10:00 a.m. at First United Methodist Church at 336 South Halifax in Ormond Beach. Following the service, burial will be at Volusia Memorial Park. In lieu of flowers we suggest a donation in Annette Rusler’s name to the First United Methodist Church to help with New Start Ministries. Online Condolences may be shared at www.lohmanfuneralhomes.com.